Great car and I hope you and wifey "enjoy the ride". What do you think about this rear end? 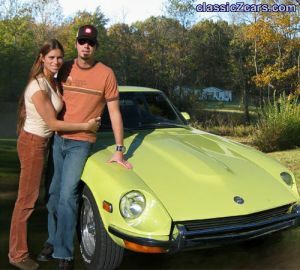 I take no offence, it is just my opportunity to build a Zed how I would like Nissan to produce one for 2003:love: The car came with an L28EFI engine that was converted to twin carbs, so there was no way I could re-build to original specs. Sooo I decided to renovate and modernise to my desire. My son has a '73 with the original engine but that will sit in the corner while he builds a 3.1Lstroker with TWIN turbos! :classic: Boy, it does get xciting! Gavin, you have a fairly strong opinion there. While we can sit back and express opinion, it really is back to the owner. "It is my car and I'll do what I want!! ":devious: My scenario is just a styling upgrade which was required anyway since most of the original metal had gone west. I try to keep an open mind on these sort of issues, but that doesn't mean I would jump at the opportunity to replicate the style that is there for us to see. That looks great! :classic: My '73 240 has a total disaster for a tail light panel so I am going to cut and shut to my hearts content. :classic: I have purchased the tail lights and rear bumper from an R32 Skyline and will graft all of the above into what's left of the rear panel. :cheeky: It will be different for sure but it will also be modern. The bumper needs about 12" sectioned out of the centre to make it the right width, but it and the tail lights match the Z rear contours remarkably well. Besides my son has already used my tailights in his '73 restoration, they were better than his! There is a school of thought that the twin carb cars, i.e. 240, 260, 280 and the Fairlady sports cars, require a constant breeze to prevent vapour lock in the fuel system. Although the thermo fan will adequately and correctly cool the engine, it will not provide that "constant breeze" to the fuel system. Just some food for thought. Sounds good to me. I am a staunch advocate of replacing rotted metal with new metal. NO FILLER TO MAKE IT LOOK GOOD. Filler is only for a difference in levels or deep scratches etc. Also there is the problem of structural components and in a unibody, IT IS ALL STRUCTURAL! The front and rear offset values are the same because the rear wheels are not steerable. It is the front wheels that have a "scrub radius" i.e. where the steering radius circle differs in respect to the wheel offset radius. You really don't want the wheel to move over an area of road surface instead of pivoting on the road surface. You can alter the offset to a degree, but sooner or later you will introduce a bad factor of scrub radius. Good day Lachlan, First I apologise, there is no way I can get to the 2003 Nationals in Brisbane this Easter. Instead, the info. you require is thusly: - the offset is in mm. i.e. this dimension is the number of mm the centre line of the rim differs from the wheel mount flange surface. A ZERO mm offset means that the rim centre line co-incides with the wheel mount flange. From there things can go NEGATIVE (wheel flange towards the centre of the car) or POSITIVE (wheel flange towards the outside of the car). Look at the average front wheel drive which has a 40 - 50 mm POSITIVE offset. Used on an older vehicle that sort of offset will cause the tyre to rub on the suspension strut. On a 240/260 the max. offset (positive) for the front is in the order of 11mm. Any more than that and you start to muck up the Scrub Radius and other technical stuff. The Zs I think came out with close to zero offset originally and yes if you fit a wider rim the offset must change to keep the tyre to strut dimension under control. Hi Judd, unfortunately I am no where near installing the engine: still repairing the body on the rotisserie. It is either too bloody hot or I get sidetracked to one of my many other projects! Tell me, is my guesstimation that the engine and 5 speed fits into the Z body without too much drama? 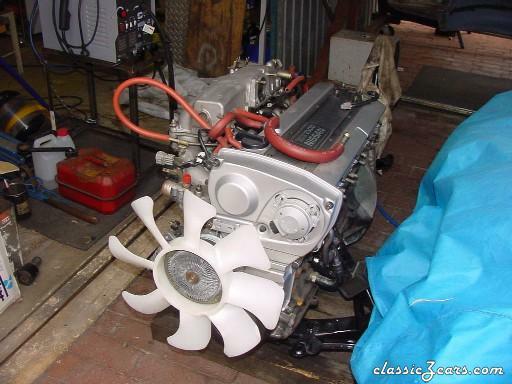 I've seen an RB20DET in a Z and it looked like it fitted perfectly:up: Take it easy, 41Deg. in Adelaide at 10:00am!!!! FLASH!!! I have an RB25DE mounted to the standard Z front x-member and the standard Z auto gearbox x-member sat sitting under my carport. The good news is there is less than 20mm difference in length between the relative bolt holes compared to the body. That means that the standard RB series engine mounts can be re-used, with the engine mount insulators rotated 180 degrees to allow the dowel pin to engage in the Z x-member. I have cut and shut the sump and oil pickup to suit the Z x-member, but for me that was a far easier option than re-engineering the x-member. As a bonus the dimension from the gear box output shaft to the diff flange is within 10mm of the original auto! That means that the standard auto tailshaft will be correct length for the new RB 5 speed. As a second bonus, the tailshaft plugs straight into the 5 speed output shaft!! Mazda owners eat your heart out!! :devious: Recently, I had the opportunity to check all this on a Z which had an RB20DET fitted to it. NO mods were evident to the standard RB engine mounts! All I see required is some minor slotting of the gearbox insulator mount holes and, VIOLA! job done. Stay tuned! I can relate, the '73 I'm restoring had barely any decent metal left in the wheel well after surgery! Sooooo I found a donor car at the dismantlers and plug welded that well into my '73. :classic: Tedious but it was worth the effort! I would not like to patch a well since it curves every which way. I guess you must decide whether the rot extent requires you to renew or patch.